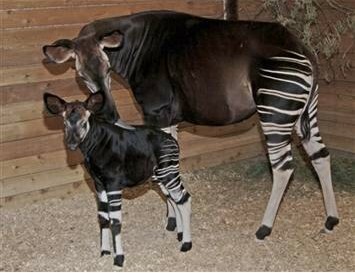 An Okapi – an endangered African animal that looks a little like a zebra and a little like a giraffe, was born in Brookfield Zoo, Illinois, recently. The little Okapi, Sauda, or ‘dark beauty’ in Swahili weighs 71kg and stands more than 9 metres tall at the shoulder. Okapi is a rare and threatened species and can only exist in the forests in parts of the Democratic Republic of the Congo (DRC). A survey conducted by the Congo Institute for Nature Conservation and the World Wildlife Fund (WWF) has rediscovered Okapi in Virunga National Park in the east of the DRC, nearly 50 years since they were last seen there. This entry was posted on Tuesday, November 28th, 2006 at 10:03 am	and is filed under Interesting Stuff. You can leave a response, or trackback from your own site. 2 Responses to "Endangered Species – Okapi (Half Zebra & Half Giraffe)"
hey this is interesting, have not heard abot it before. cool cool. I am currently doing a project about endangered species at school and the okapi caught my eye. Very interesting and very beatiful.